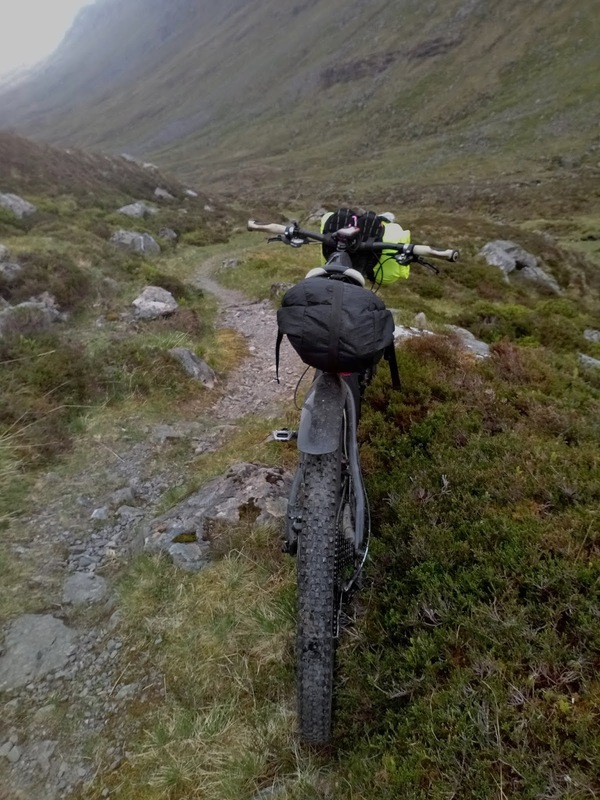 A few accounts of my outdoorsy adventures past and present. 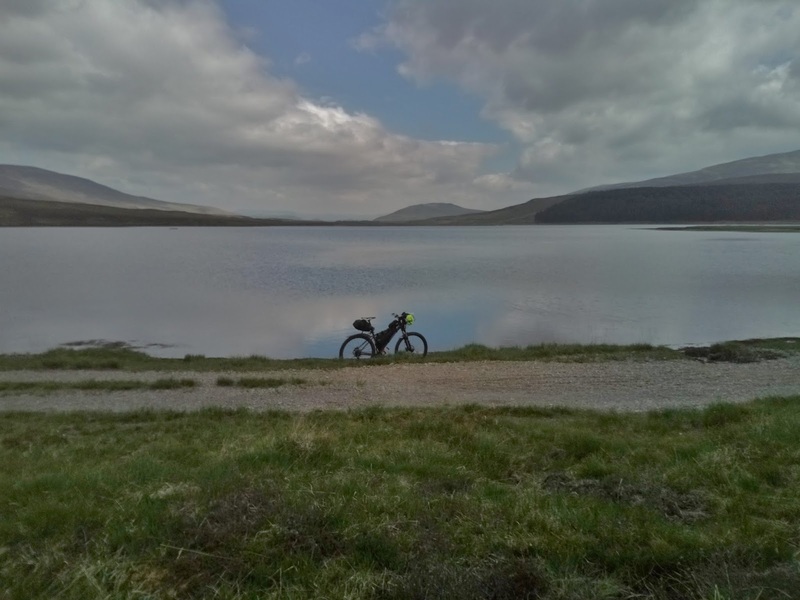 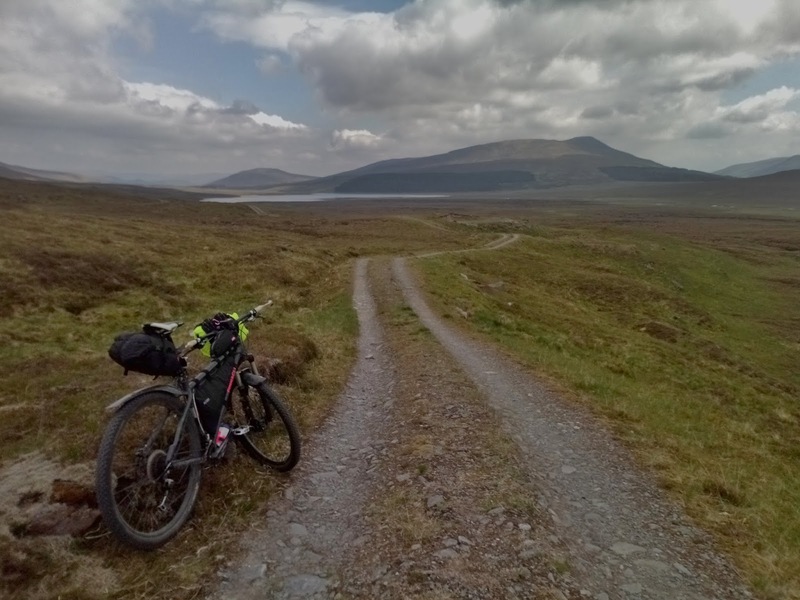 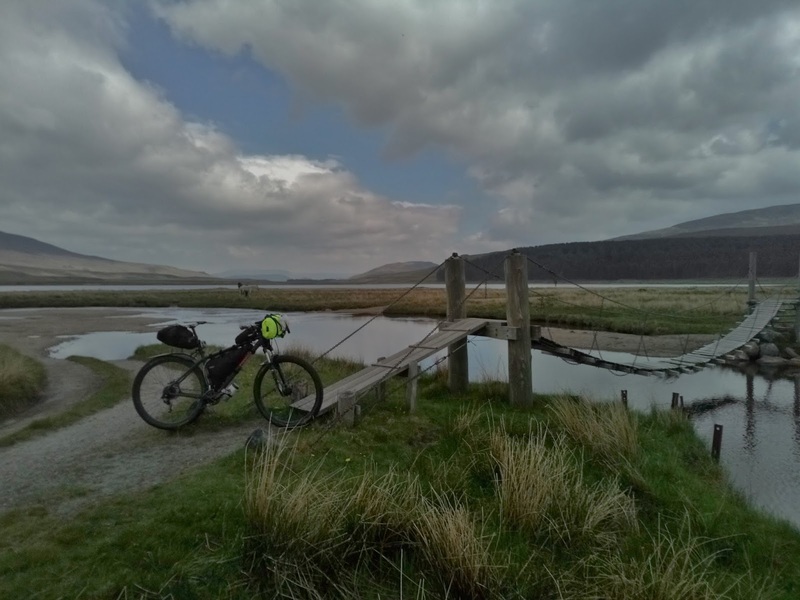 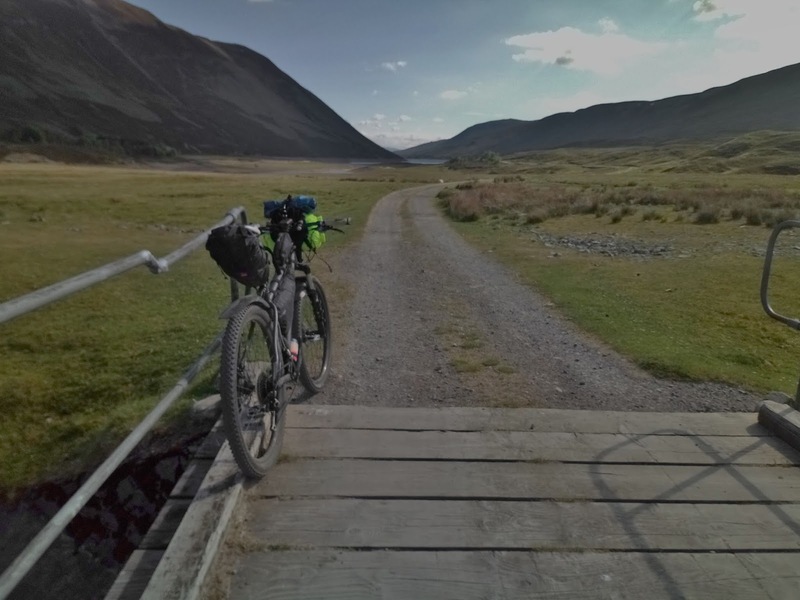 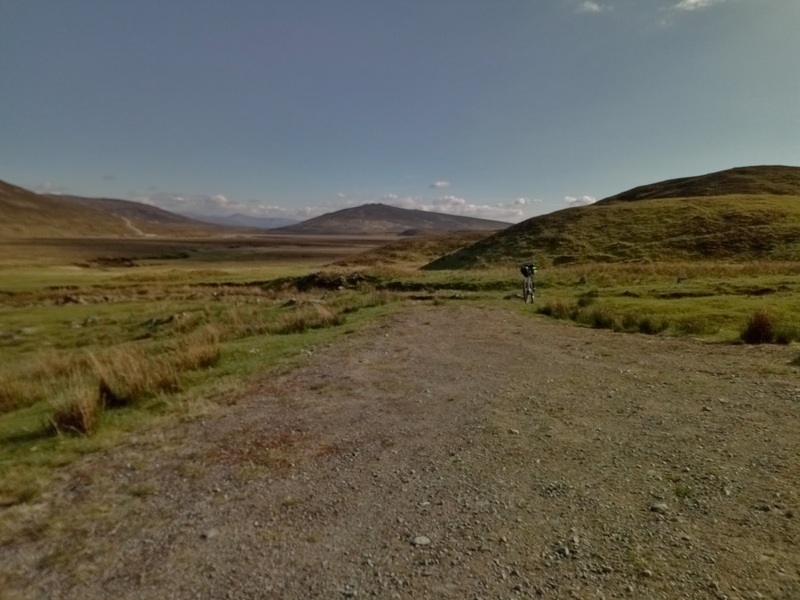 I've been planning to do a ride in the vast, largely uninhabited area around Ben Alder for some time. 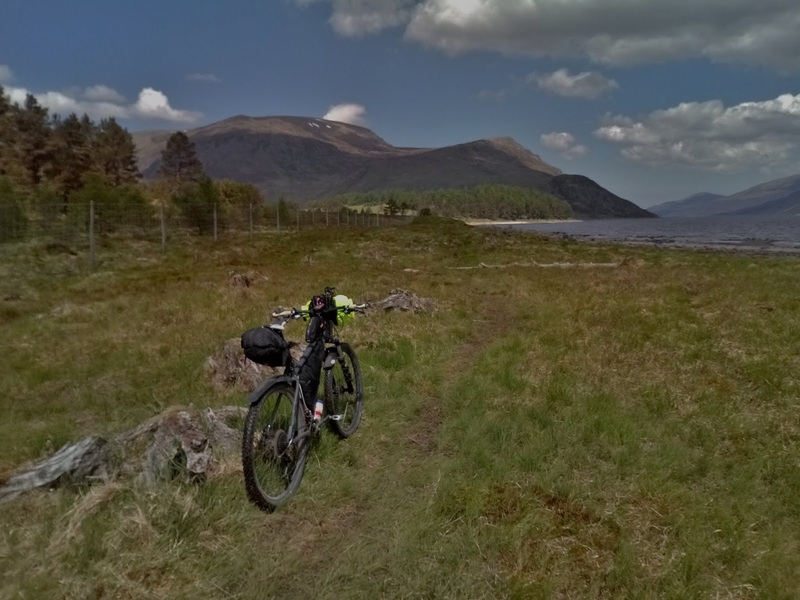 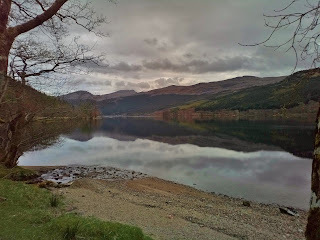 I'd plotted a route starting and finishing at Dalwhinnie (inspired by reading other accounts on the net) and taking in Loch Garry, Loch Rannoch and Loch Ericht. As I mentioned the area is quite wild so I'd hoped to do this ride with others (both for the company and for added safety) but the recent long dry spell and resulting good ground conditions prompted me to just go for it on my own. 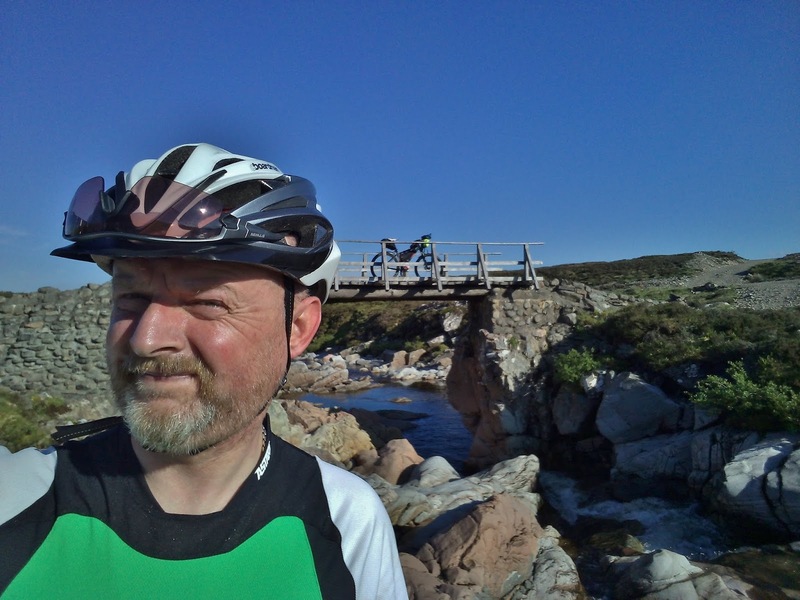 The drive up to Dalwhinnie takes a while and this combined with a late start meant that I didn't actually start cycling until after 4pm. 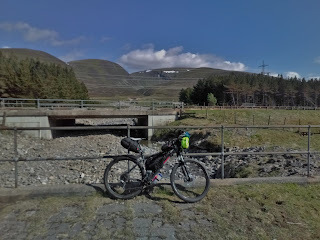 The first section was down the cycle path that follows the A9 from Dalwhinnie south to Dalnaspidal Lodge. 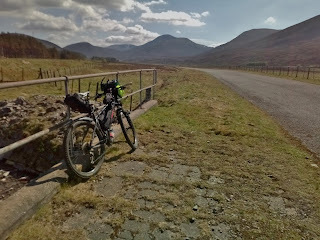 As I'd anticipated this section fell more into the "to be endured" category with the heavy traffic on the A9 roaring past and a stiff headwind to contend with. At least the surrounding hills and glens were picturesque to provide some distraction though. It didn't take too long to get to Dalnaspidal where I left the cycle path and headed off road towards Loch Garry. 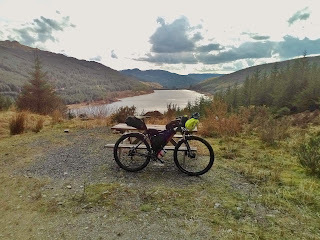 My route now followed a good estate track along the bank of Loch Garry for a few miles. 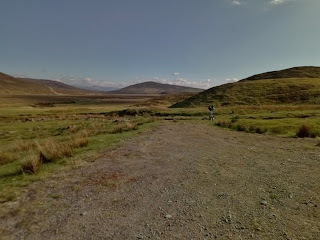 The track continued just beyond the end of Loch Garry where it petered out abruptly to be replaced by a vague walkers path across the low lying boggy ground leading up to the start of another estate road which would take me to Loch Rannoch. In accounts that I'd read of riding this section the going had been described as boggy hike a bike but as I'd hoped the dry weather meant that some of it was rideable for me. 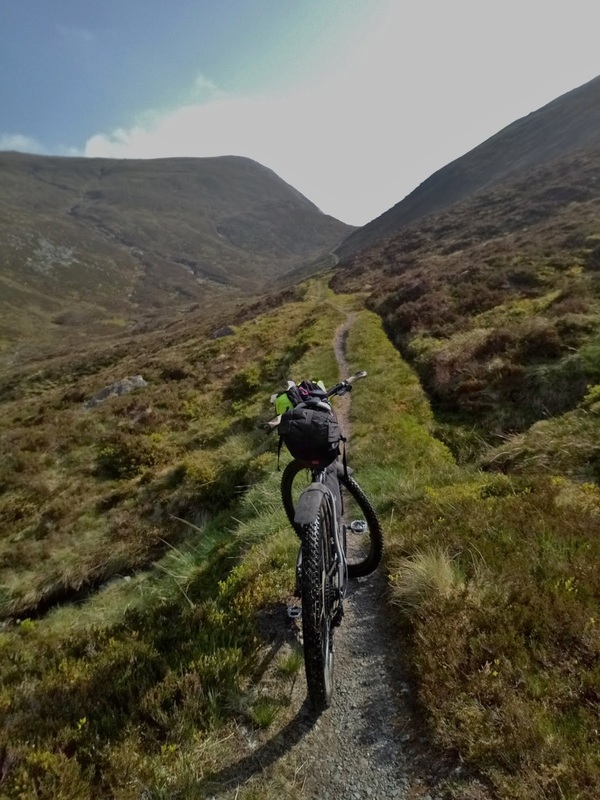 Spot the trail! 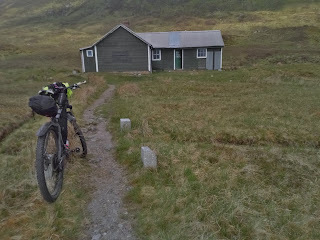 The end of the estate road and the start of a tenuous path across the flat boggy watershed. 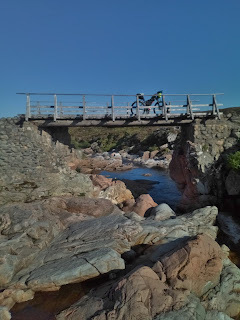 After a mixed riding and pushing section for a couple of miles I reached the next estate track which led me to a lovely old bridge (with a more substantial modern bridge just upstream). 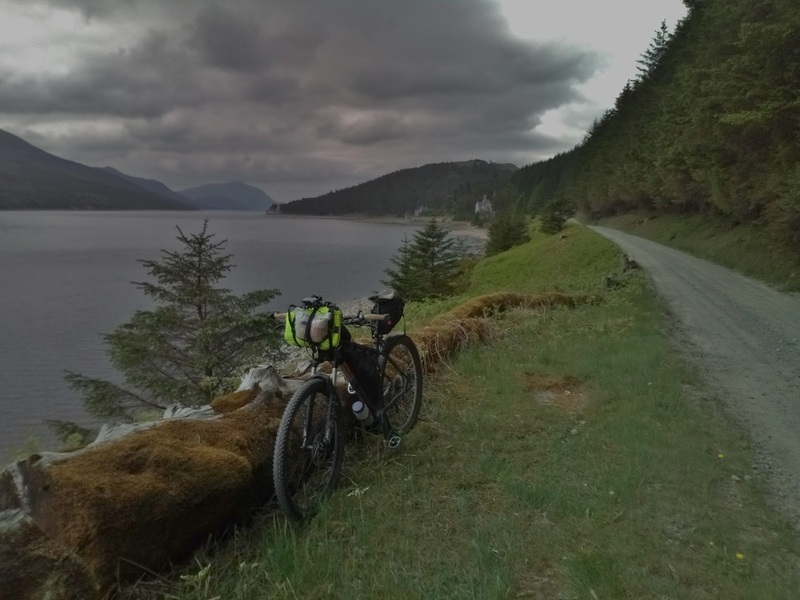 It was a pretty spot so I stopped for a few pictures. 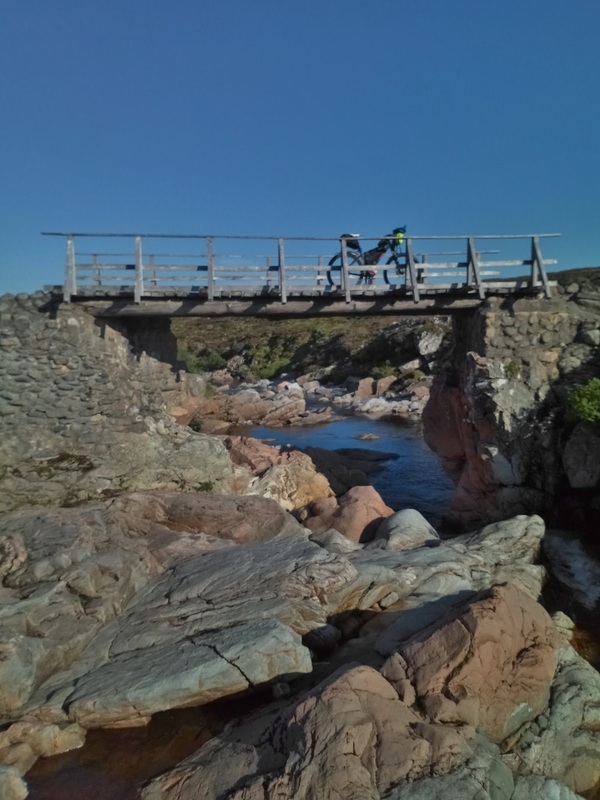 From the bridge it was a short ride to my overnight stop for the night at Duinish bothy. 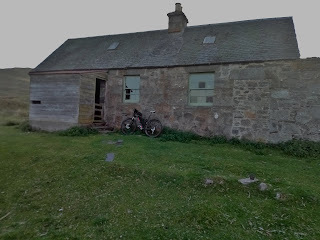 This is an estate bothy (not one administered by the MBA) so I wasn't sure what to expect but it proved to be a nice enough place to spend the night. 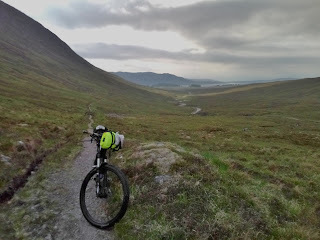 My plan for the next day didn't involve a huge mileage so I decided to have a lie in until 8am, despite this I was back on the trail by 9:30 and heading for Loch Rannoch on a good estate track. 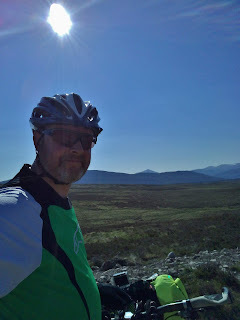 As I progressed further south the unmistakable profile of Schiehallion appeared on the horizon. From this direction it looks like a spectacular peak but in reality it's quite a boring walk (I know, I've climbed it!) 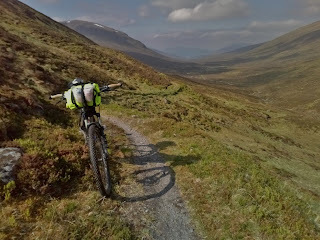 It was to feature in my views for quite a while as I dropped down towards Loch Rannoch. 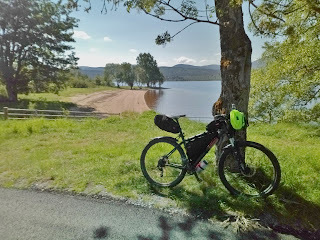 After a fast dusty descent I got down to the road that runs along the northern side of Loch Rannoch. 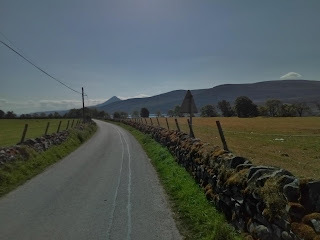 The next section was along this road and I'd anticipated it being a bit dull, in reality it was very pleasant with light traffic and lovely views in the bright sunshine. I followed the road until just before Rannoch Lodge where I once more turned off road and climbed a steep forest track northwest. 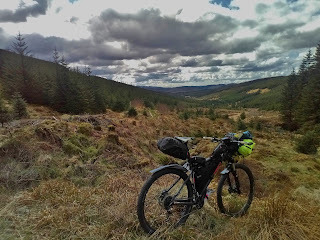 Eventually I emerged from the forest and the views opened up. 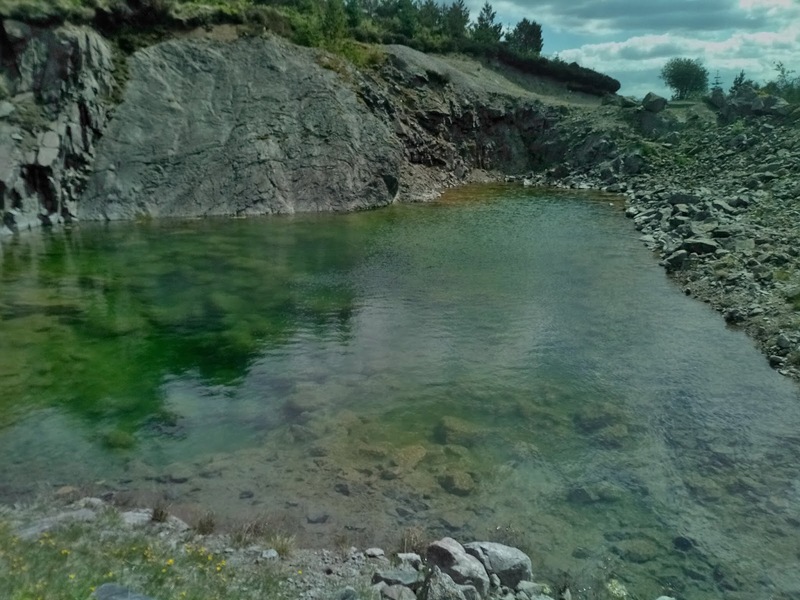 It was really hot work and I passed a tempting clear green pool at the side of the track, curiously it had small fish in it but no obvious water sources feeding or draining it. How did the fish get there I wonder? As I gained height the views west opened up and I could pick out more familiar landmarks (such as the mountains of Glencoe) in the distance. Ahead the bulk of the Ben Alder massif began to appear. The track turned downhill and I was treated to a high speed blast down towards Loch Ericht after which I continued along the western shore of the loch. 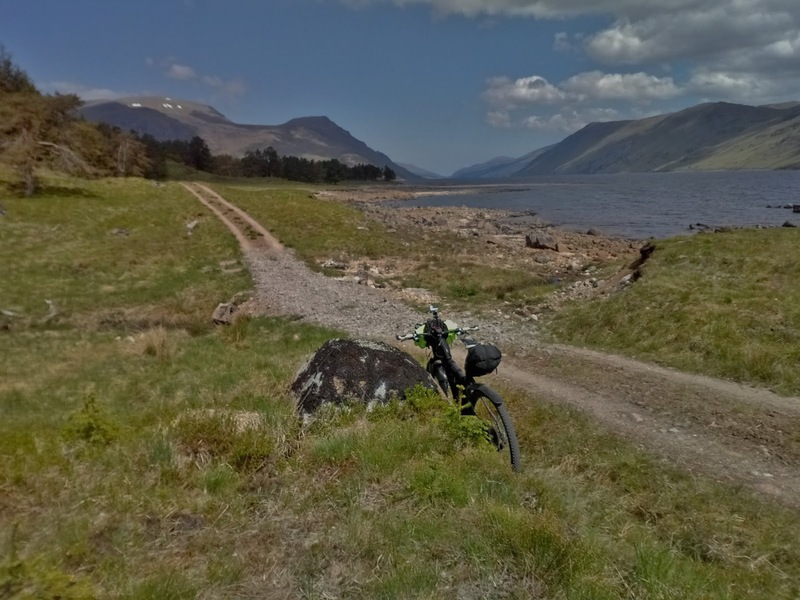 From past experience (and from online research) I knew that the good track along the lochside would only last so far after which another potentially boggy hike a bike section would be in store. 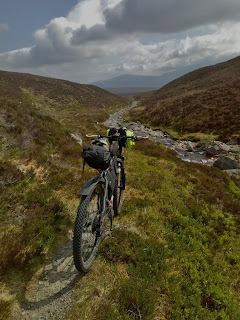 Once again however the dry weather helped me out and much of the section between the end of the track and Ben Alder Cottage proved to be rideable. 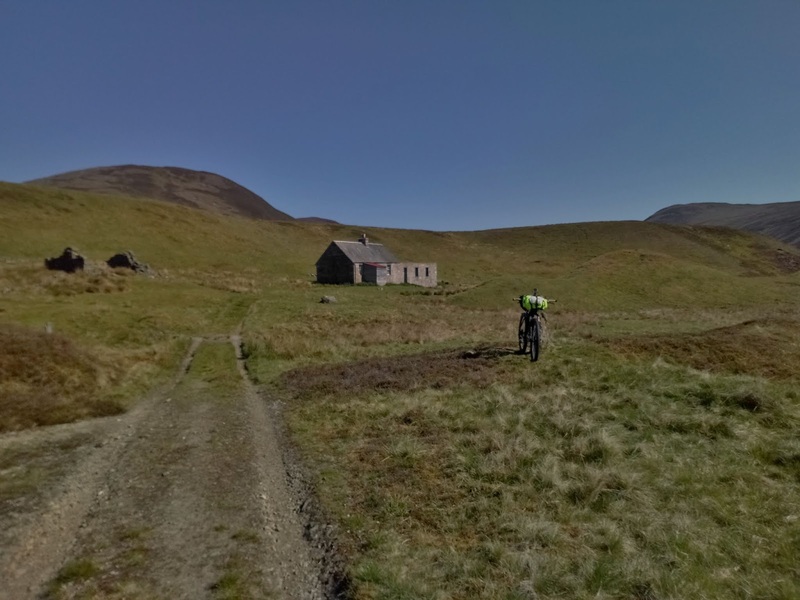 After one final push Ben Alder Cottage came into view in the distance and as it was downhill I was optimistic that I'd be able to ride all the way. 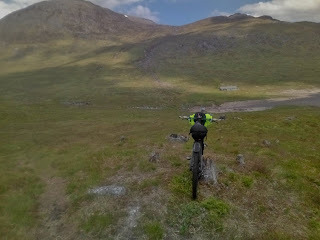 Inevitably this lead to my front wheel sinking into a soft patch catapulting me knee deep into a bog! 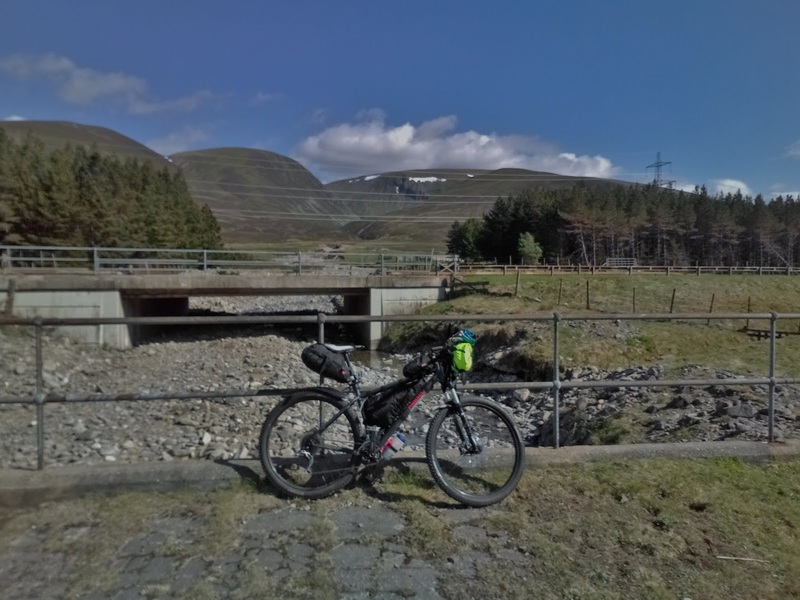 I managed to get out without losing my shoes (a real danger) and continue on down to the bridge over the Alder Burn and on to the bothy. 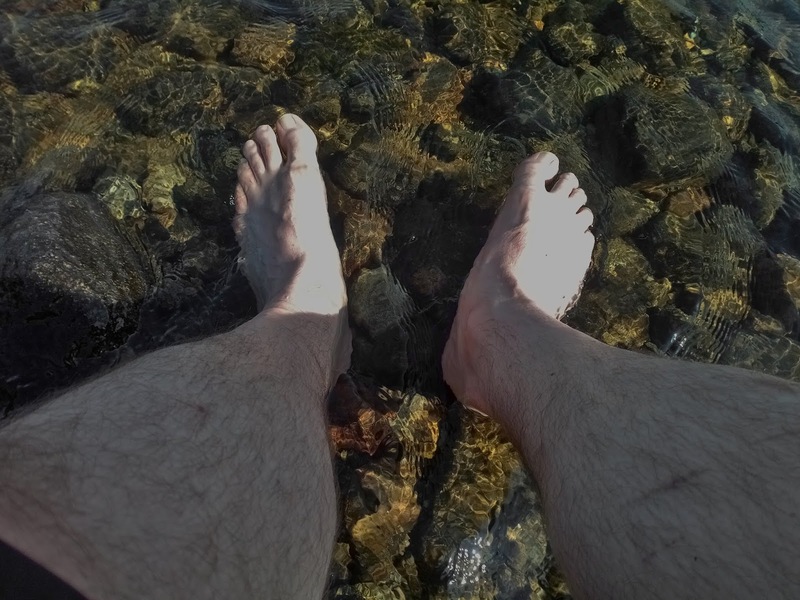 I'd arrived much earlier than I expected and briefly contemplated pushing on but I was in no rush and it was a lovely afternoon for lounging about at such a nice spot so I had some late lunch then went for a swim in the burn to cool off and wash my muddy legs. 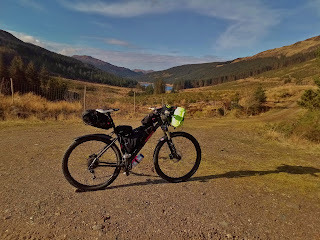 Later I was joined by a couple of hillwalkers with a dog and some fellow bike packers (three guys on long travel trail bikes doing their first overnighter and a Dutch guy who had been riding the Highland Trail 550 route in reverse) who were all very friendly and interesting to chat with. 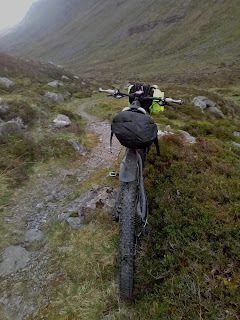 The next morning I woke early and packed and ate breakfast as quickly as I could before starting the singletrack climb up towards the Bealach Cumhann. This section (and the bit after it over the Bealach Dubh and down towards Culra) was the section of the route that I'd been looking forwards to the most. I knew that much of the climb should be rideable (despite climbing up to over 700m at the Bealach Dubh) as it was on well surfaced singletrack. The only slight fly in the ointment was the frequency of deep, square edged water bars that crossed the trail providing drainage. 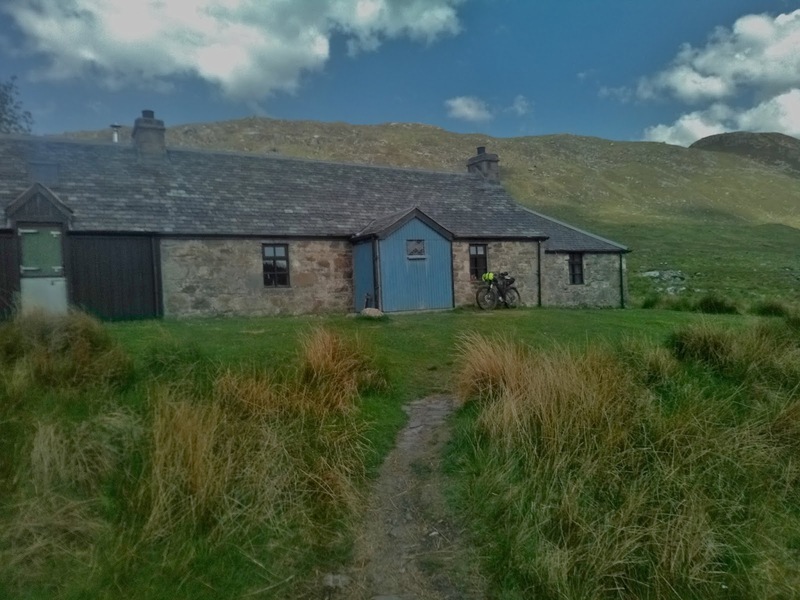 My fellow cyclists at the bothy had mentioned that they could be a hazard leading to a puncture, damaged wheel or worse a crash if they weren't negotiated with care so I started out cautiously. After a while though I got into the groove and was able to successfully bunny hop my bike clearing most of them which only added to the fun. 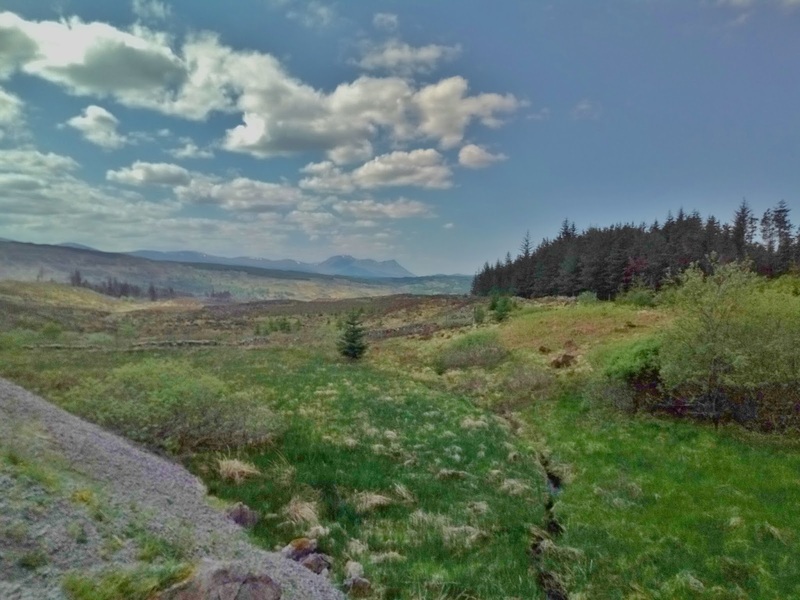 Looking up towards the Bealach Cumhann. 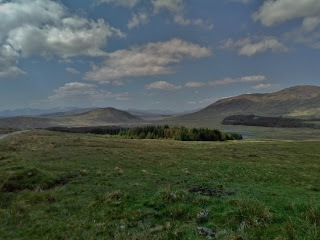 The view back to Loch Ericht in the distance. 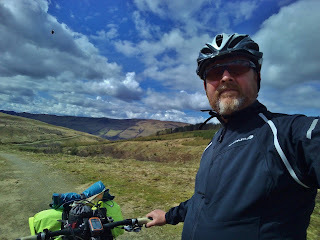 Although it was a bright morning, as I got higher the hills around me were shrouded in clouds adding to the atmosphere. 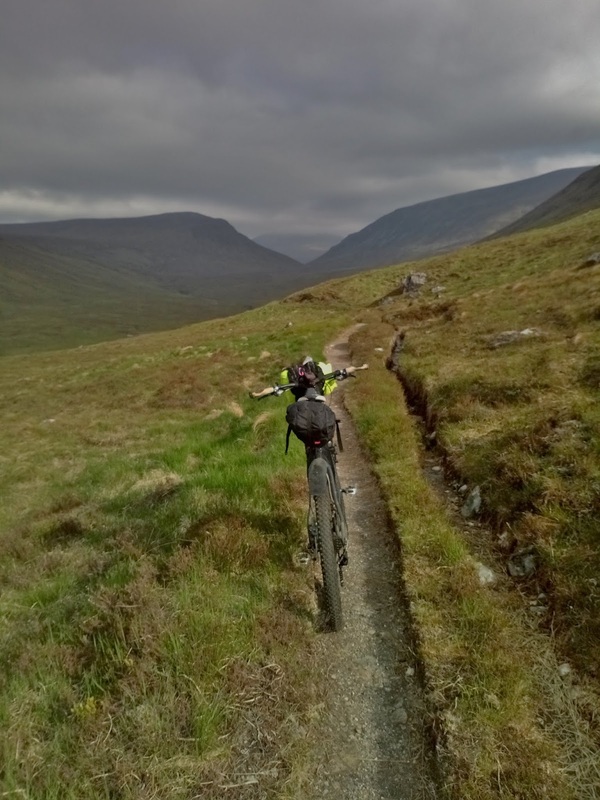 Once I'd crossed the Bealach Cumhann the gradient eased for a while and there were even a few downhill sections which were fantastic fun to ride. The view opened up to the southwest down towards Loch Ossian and Rannoch Moor. I pushed on up the Bealach Dubh promising myself a rest at the top and a bite of food, the last section up to the bealach was pretty steep and hard going but soon I popped out at the top. 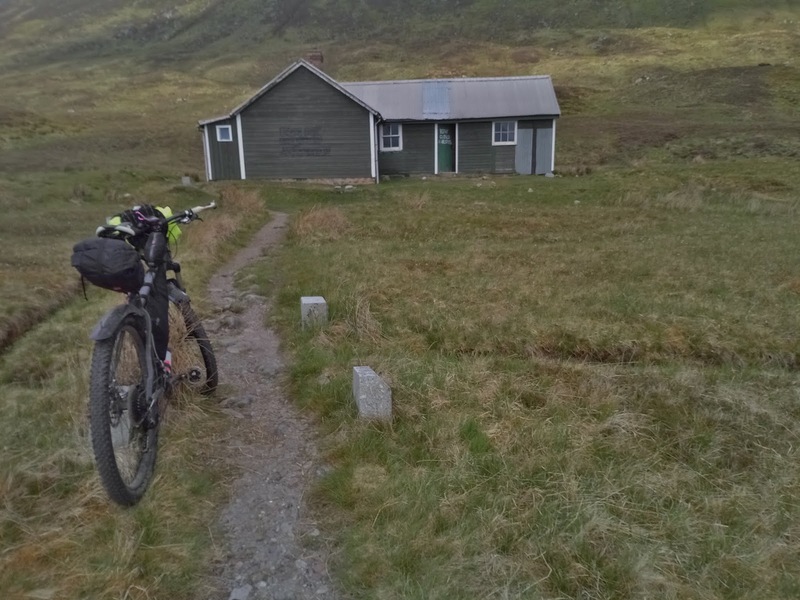 After a breather at the top I set off down the other side of the bealach, the guys at the bothy had warned me that the top section of the descent was very steep but it wasn't actually too bad other than a few awkwardly placed water bars. 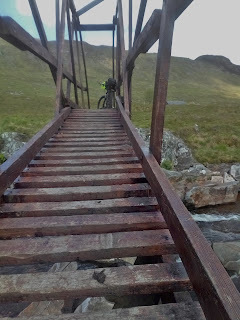 It was fantastic whizzing down the steep descent bunny hopping the water bars as I went. 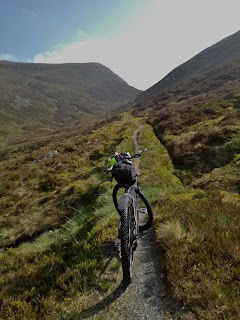 Lower down the gradient eased but the trail started to snake more making it even more fun to ride, I also passed a section in a small river gorge which was absolutely beautiful. 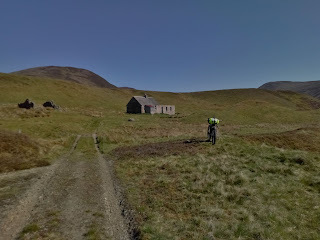 All too soon the sublime singletrack came to an end and I popped out onto a landrover track which passed the sad sight of Culra bothy (now abandoned due to asbestos used in it's construction). 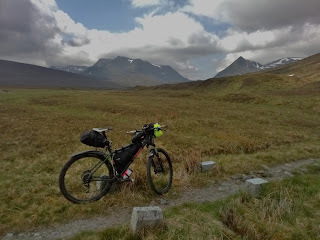 The Ben Alder massif looked very impressive back in the direction that I'd come from. 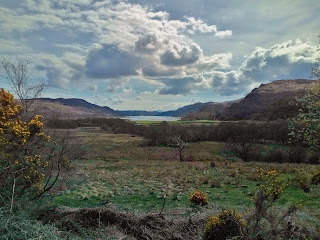 I pushed on towards Loch Pattack which came into sight in the distance. 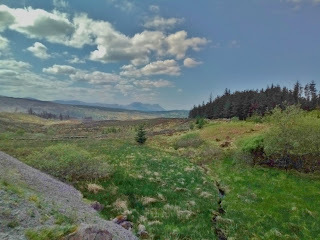 As I followed the track towards the loch I noticed another track branching off to the right, it looked a bit tenuous and I couldn't be bothered stopping to check the map so continued on following my gps, I was later to be caught up by my friends from the bothy who took the right hand fork in the track which they said cut out quite a lot of distance. 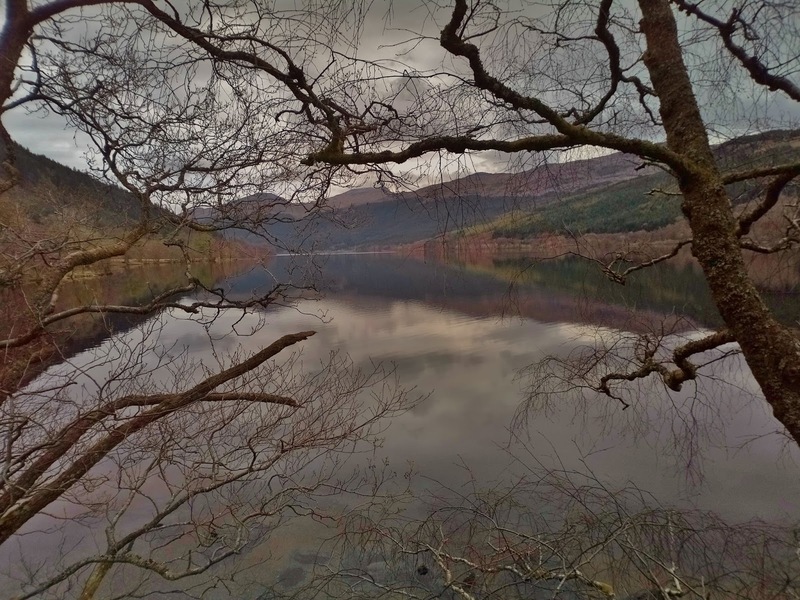 I reached the loch and stopped to take more pictures before crossing the wobbly suspension bridge across the river feeding Loch Pattack. 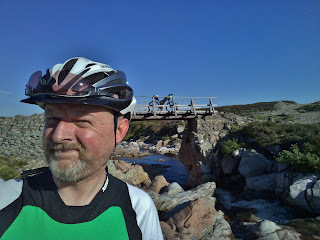 At the other side of the bridge I was greeted by two ponies one of whom was very friendly, enjoying being petted and scratching his/her neck on my bike handlebars. 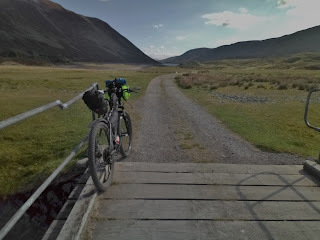 After a short break to enjoy the company of my new equine friend I set off again joining another estate track leading towards Ben Alder Lodge with it's impressive turrets and electric gates! 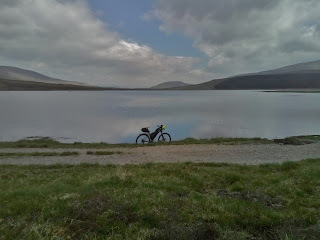 My route now followed the shore of Loch Ericht once more back towards Dalwhinnie. As I've mentioned I was rejoined at this point by the three guys on bikes who I'd met at the bothy so it was really nice to have some company for the last few miles. 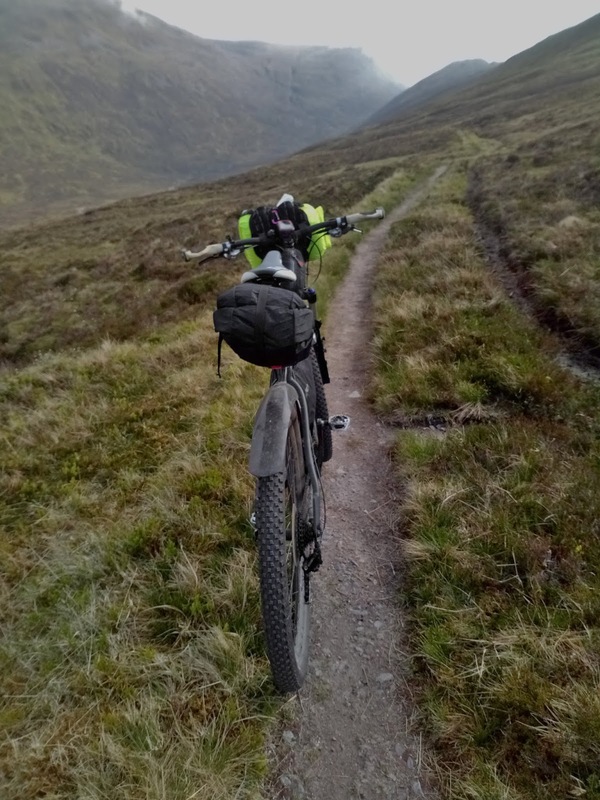 All too soon it was time to go our separate ways though, they were heading on to Torridon for some more mountain biking adventures while I was heading home. 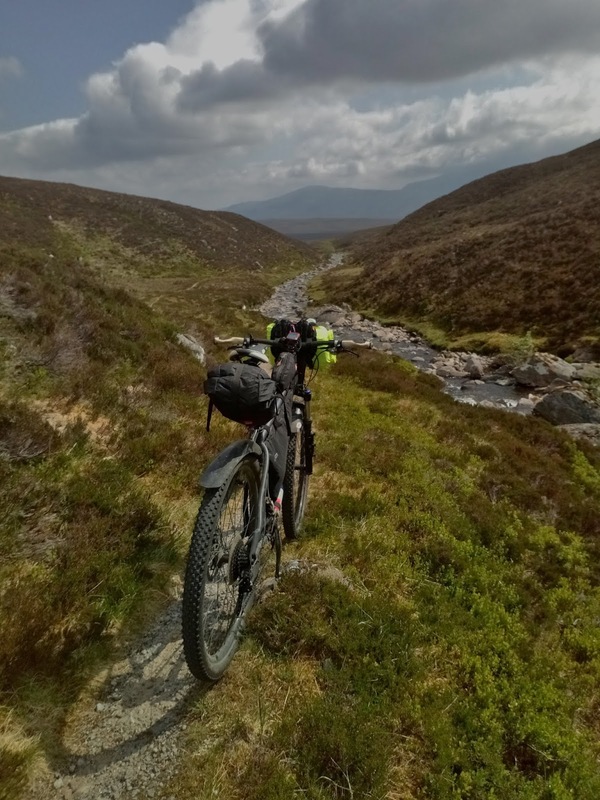 This had been a great trip, I was very fortunate to be able to do the ride during a rare spell of dry, hot weather and the scenery was spectacular. 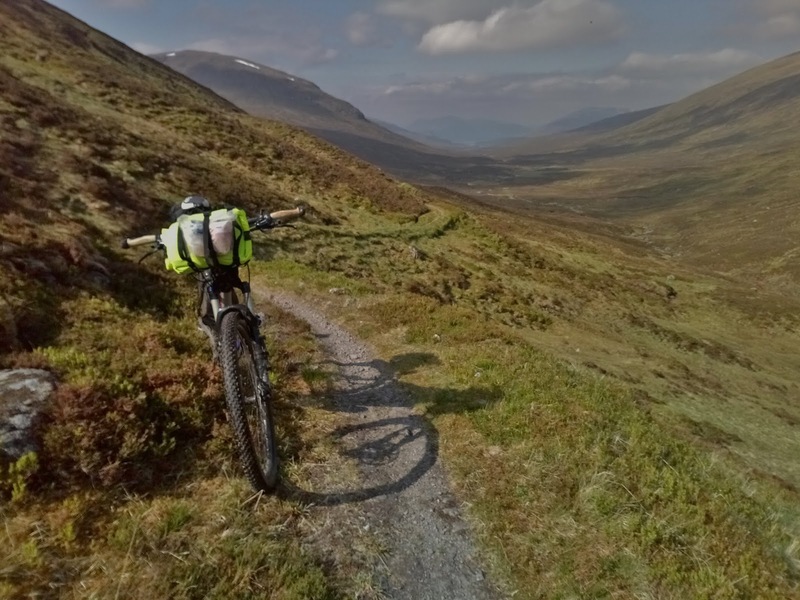 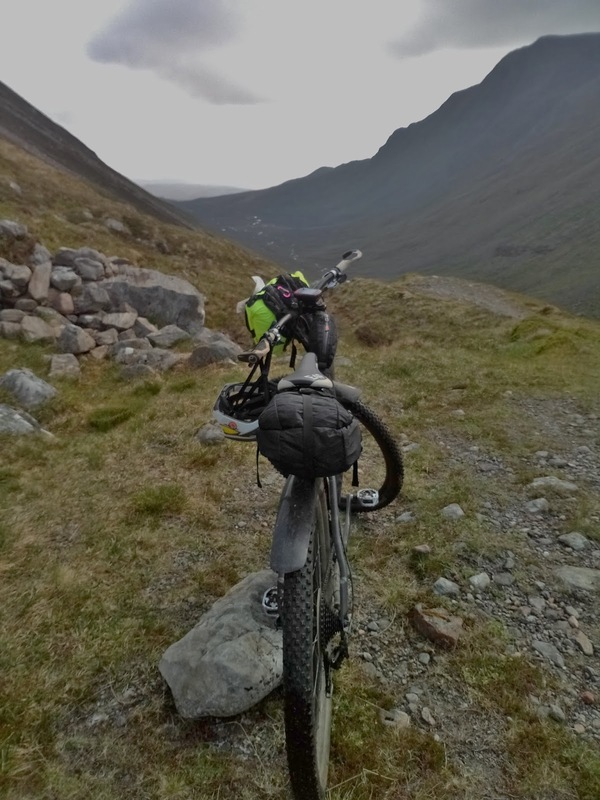 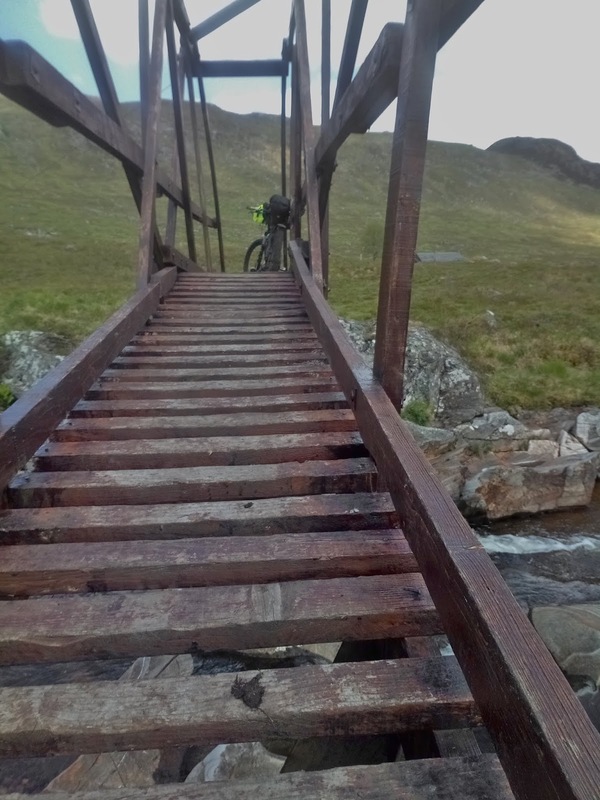 I'd definitely hope to go back and ride the singletrack over the Bealach Dubh and Bealach Cumhann again (possibly doing an out and back trip to Ben Alder Cottage to ride the trail in both directions). 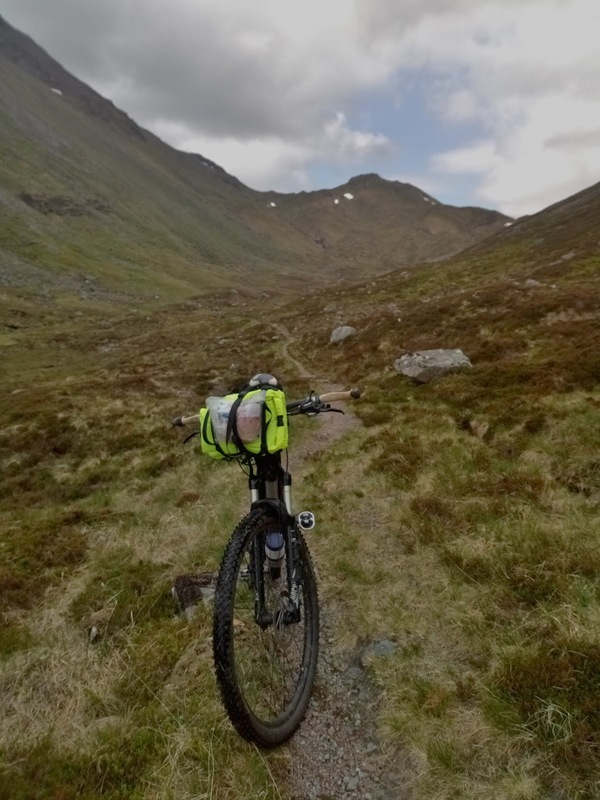 Below is the video that I made of the trip. Last autumn I did a bike trip from Rannoch Station back to Bridge of Orchy and surprised myself that I was able to ride the route in a day (even though I'd planned to do it over a two). 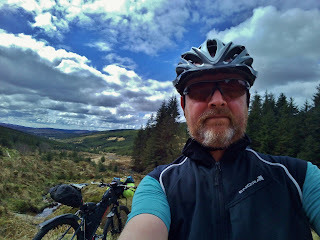 During the winter I've tried to keep the momentum up with my cycling but almost inevitably my fitness has slipped downwards and my weight has slipped upwards. 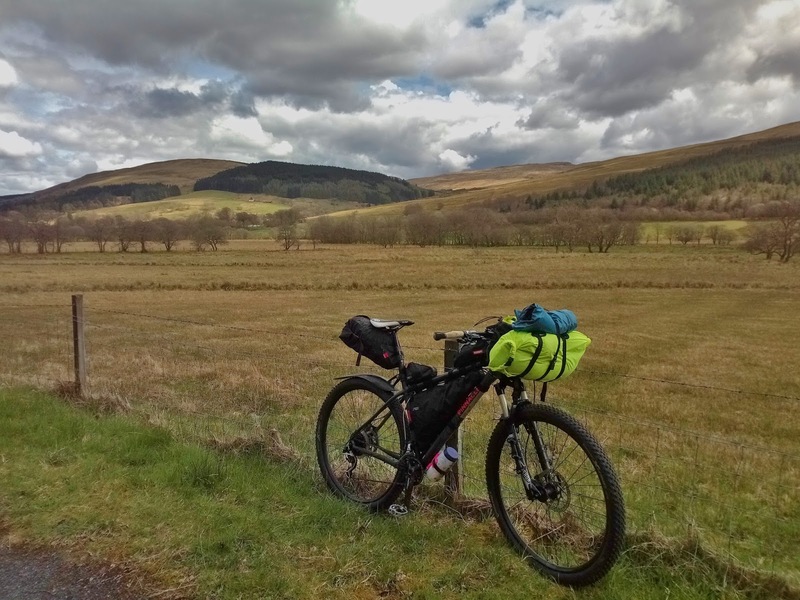 After a number of false starts, the weekend saw me finally make it back out to do a bikepacking trip. 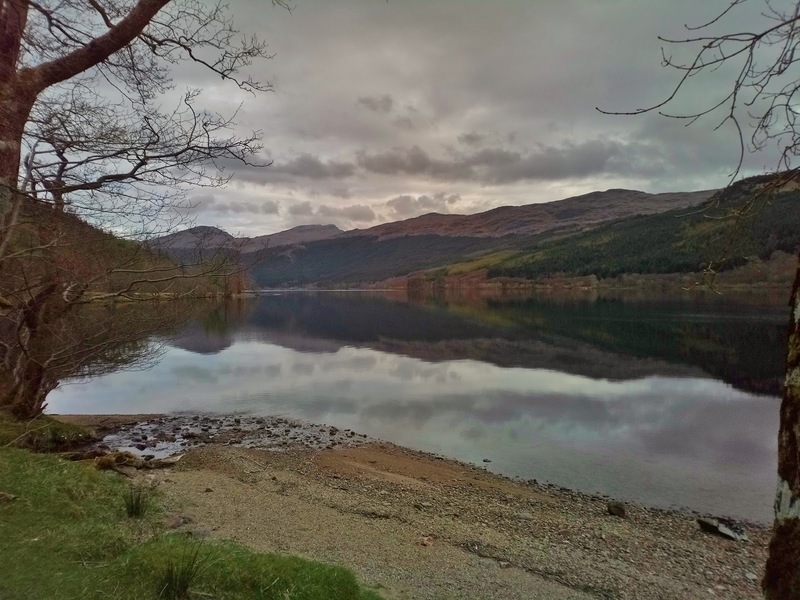 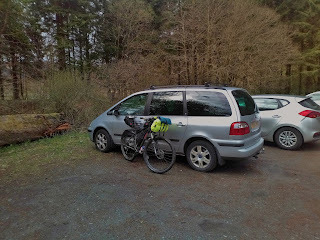 I have a number of routes that I hope to tick off this year but felt that it would be sensible to start off with something that wasn't too ambitious (given the factors mentioned above) so after a last minute food shop I hit the road to drive round to Glenbranter on the Cowal Peninsula. 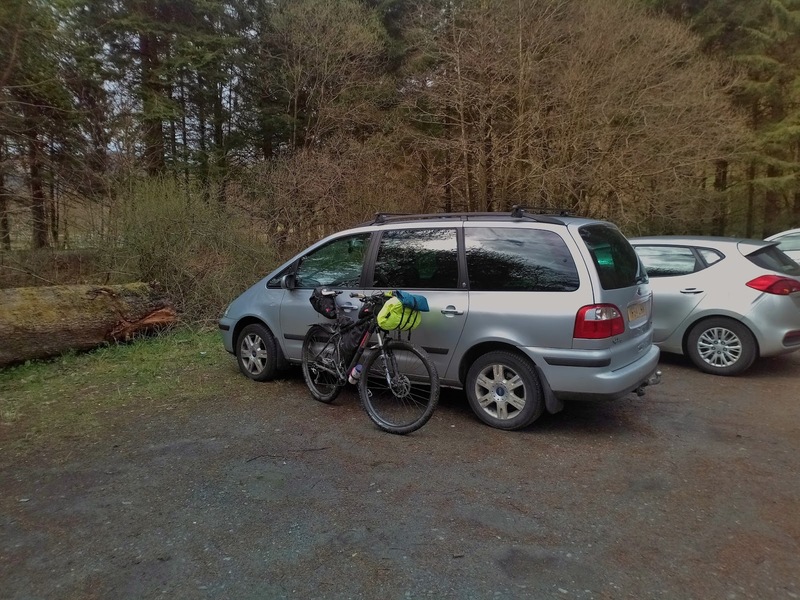 This was to be the starting point for the route that I had in mind and I was pleased to find a large car park with no restrictions or charges where I could leave the car. 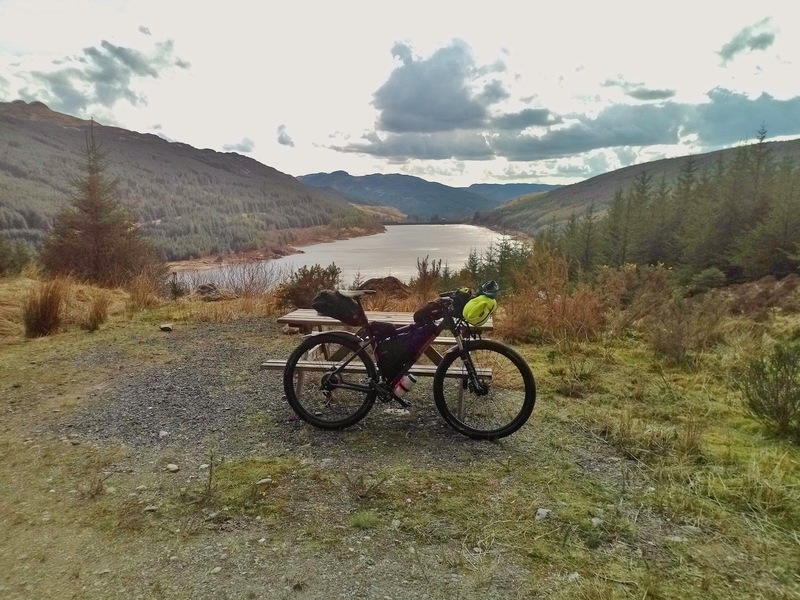 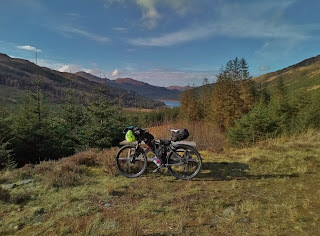 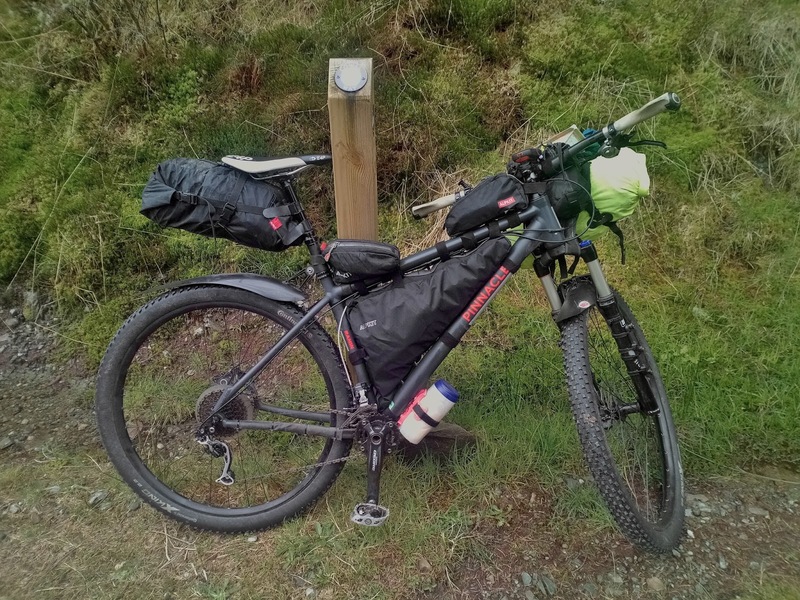 I quickly loaded up my luggage onto my bike and set off up the climb out of Glenbranter heading roughly southwest following the Cowal Way long distance path. 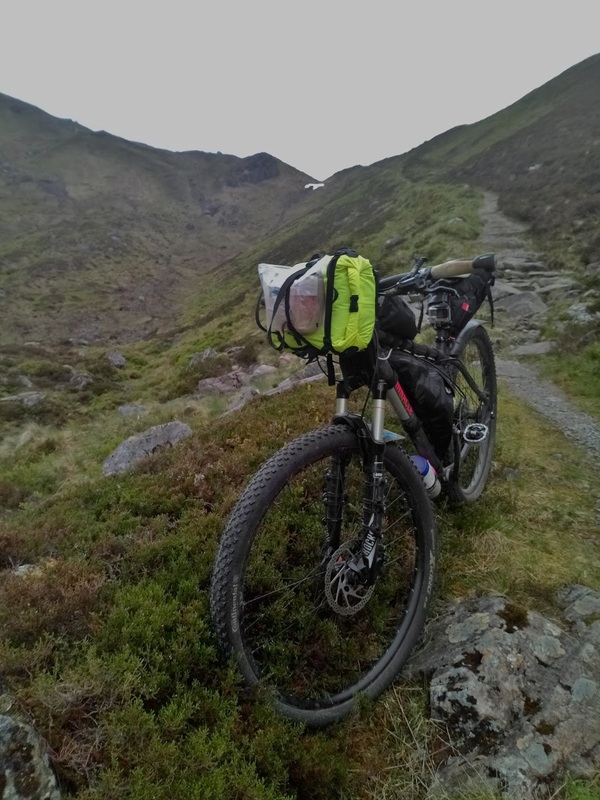 It was steep and relentless climbing on a forest road (not made any easier to handle by being caught and passed by another bikepacker). 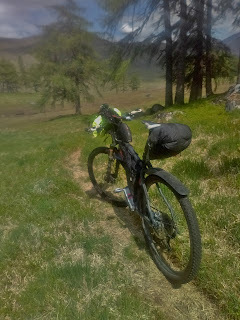 After a brutal warm up the gradient eventually relented and the views began to open up a bit. 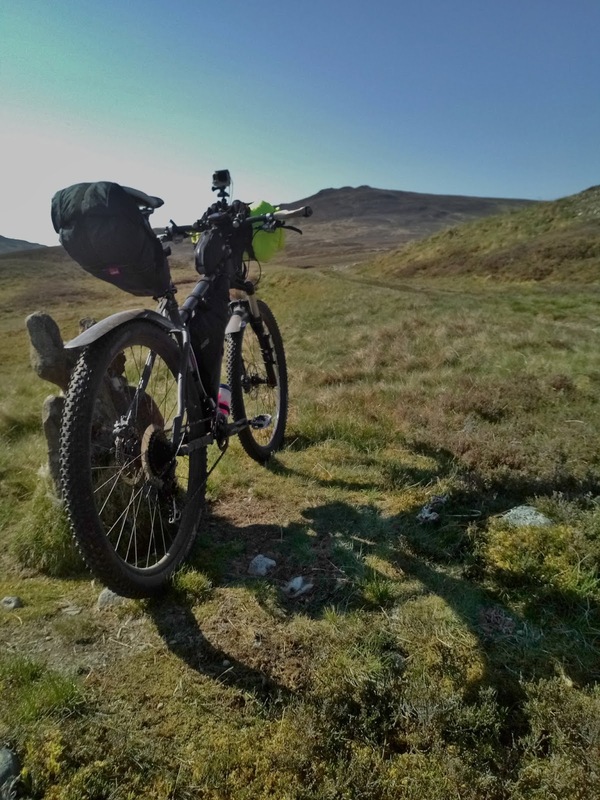 The sun was shining making it tricky finding the correct amount of clothing, I was overheating badly on the climb but as soon as I picked up speed on the flatter terrain of Strath nan Lub I started to cool down quickly. 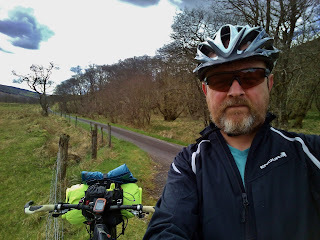 I'd zipped the sleeves off my jacket but they soon went back on again as I whizzed down the lovely winding track towards the farm at Garvie. 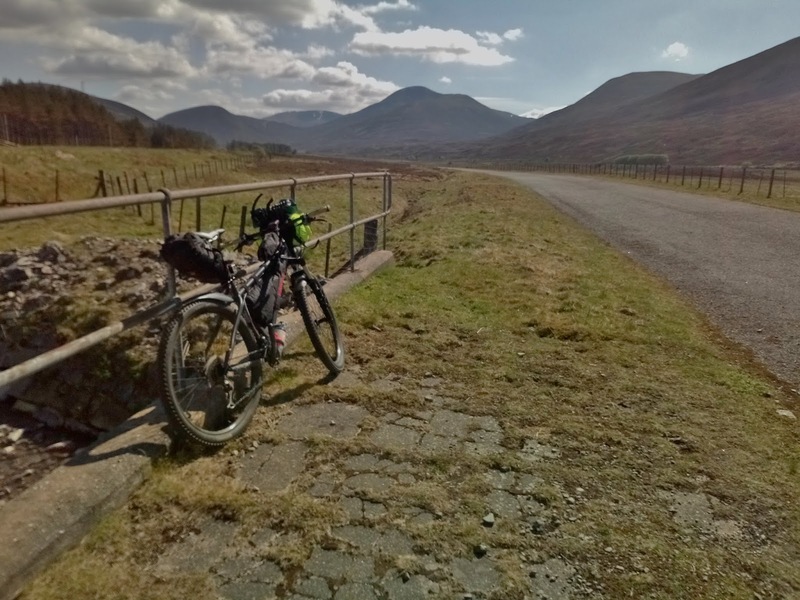 I knew from studying the maps that there wasn't likely to be any technically challenging riding on my route but the lovely weather, beautiful scenery and fast winding track made for very enjoyable riding anyway. 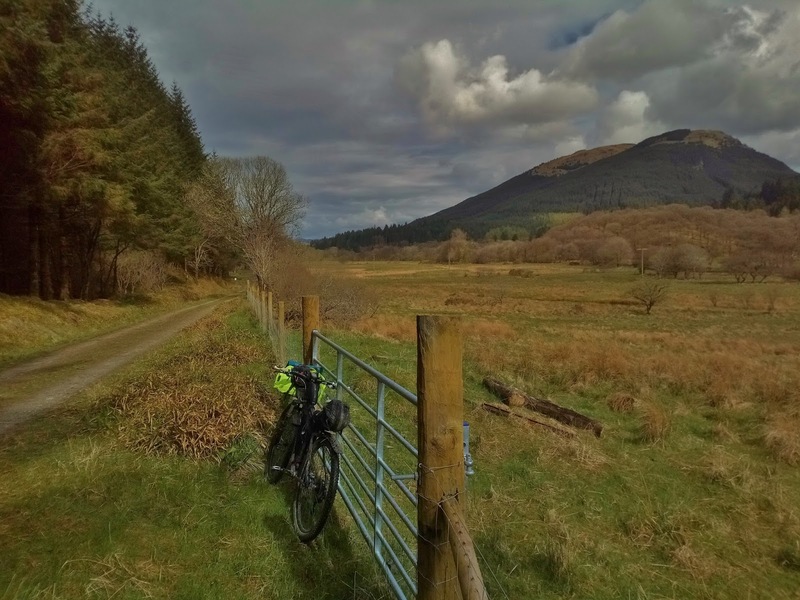 At Garvie I turned briefly onto the A886 road before continuing to follow the Cowal Way down the quiet unclassified road towards Glendaruel. 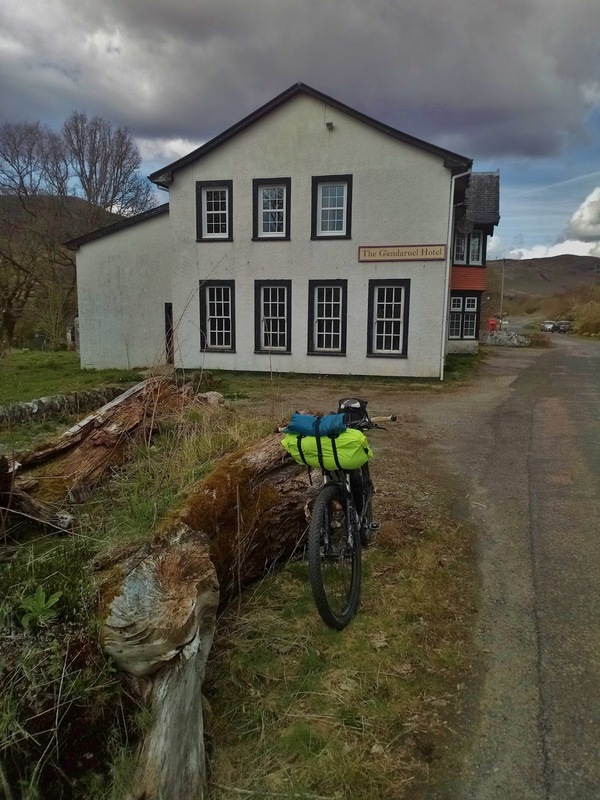 At Glendaruel I stopped briefly to watch a game of Shinty being played before pushing on past the sadly derelict Glendaruel Hotel. 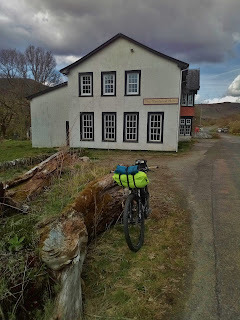 It would have been great to call in for a swift pint but as with many such remote establishments the hotel seems to have fallen on hard times. There was nothing for it but to have a swift swig of my energy drink and push on rejoining the main road A886, passing the turn off for Tighnabruaich before turning off myself onto the B836 towards Loch Striven. 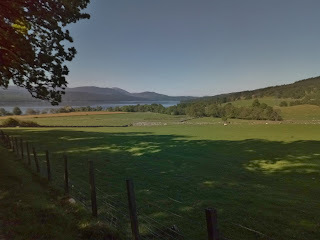 I was treated to fleeting glimpses of the Kyles of Bute in the distance. 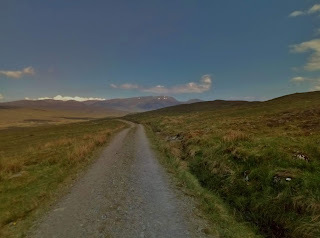 I'd ridden this road a few times on my motorbikes so knew that I was in for more hard work. 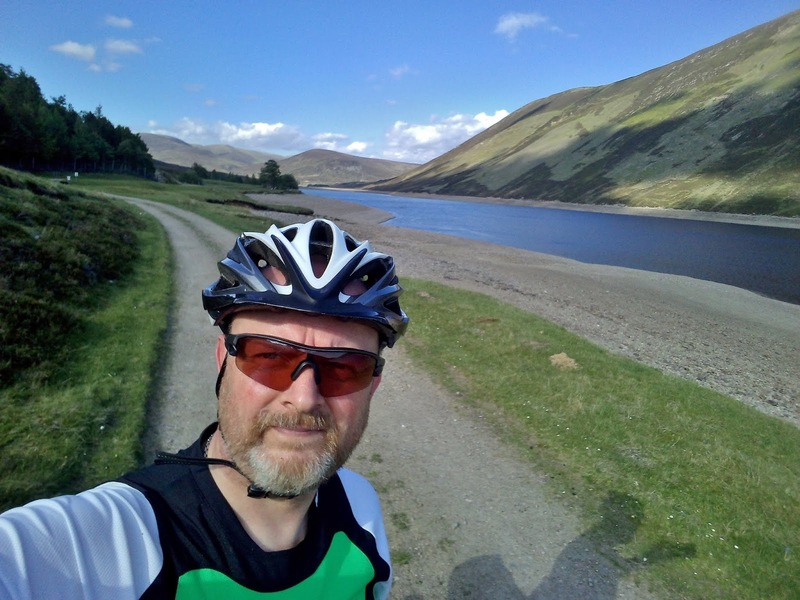 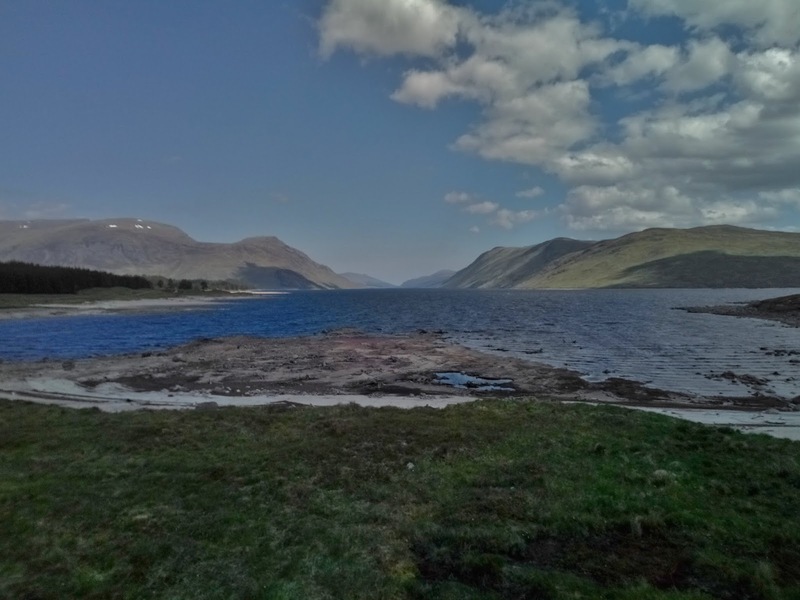 I toiled up a steady climb past Stronafian all the while knowing that I was going to lose all my hard gained height when I dropped back down to sea level at the head of Loch Striven. 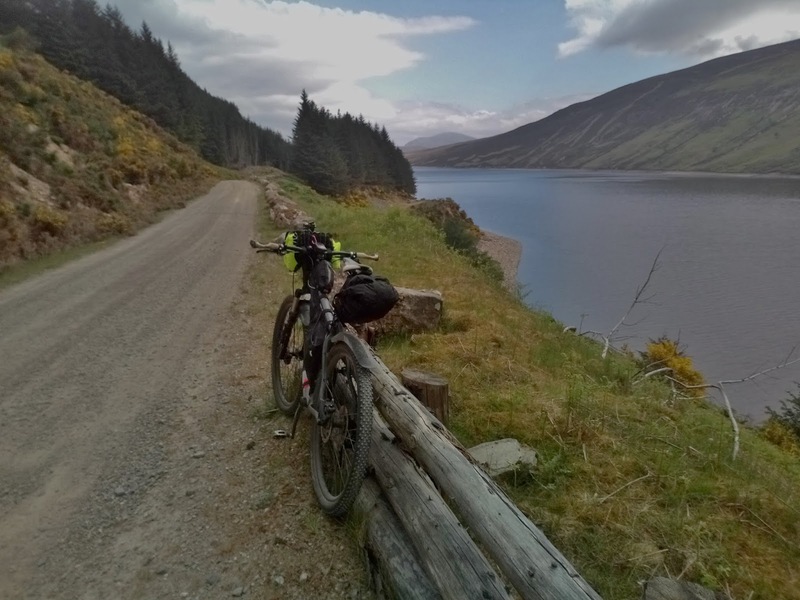 The consolation was that the descent was a hoot (I was able to easily keep up with a van that overtook me at the top) and the views down the loch were superb. 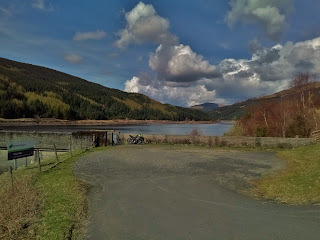 Next it was another steep climb up towards the reservoir at Loch Tarsan. 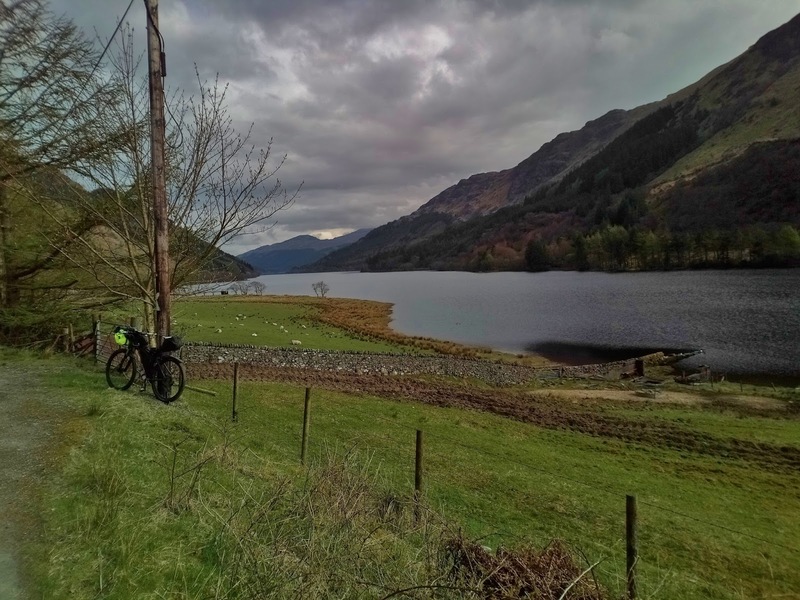 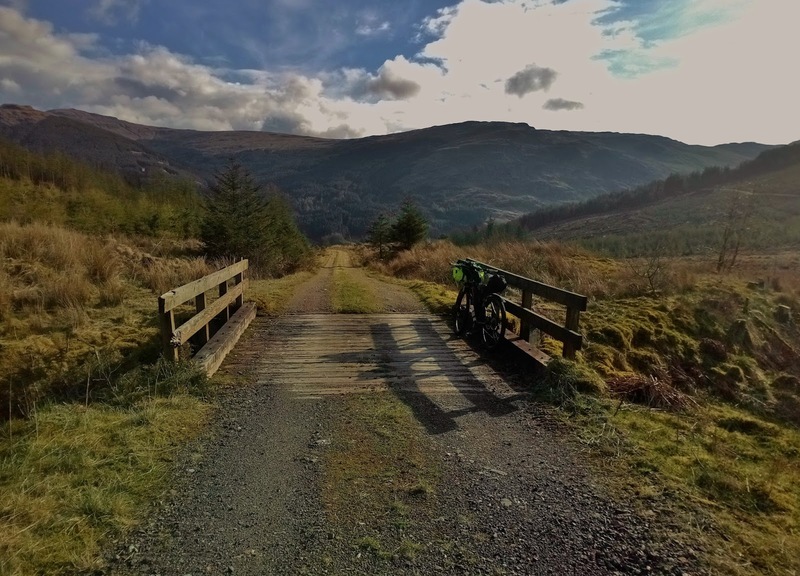 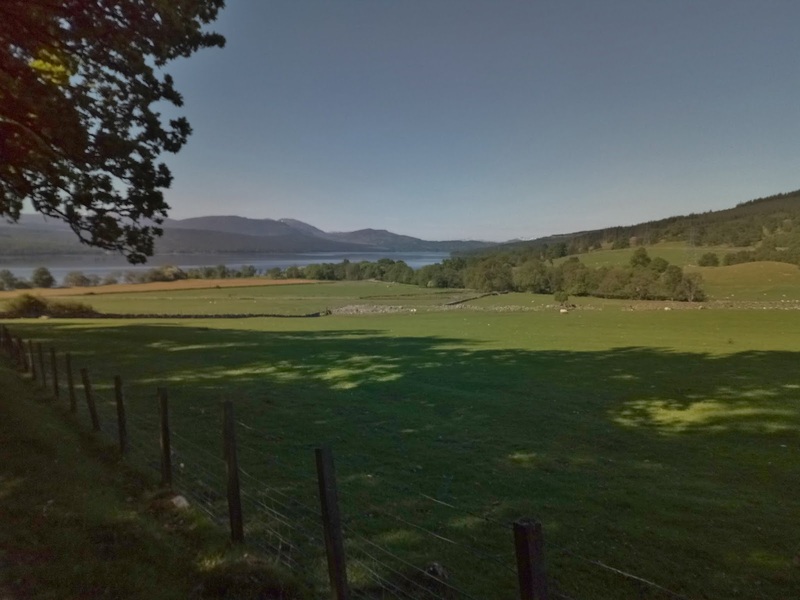 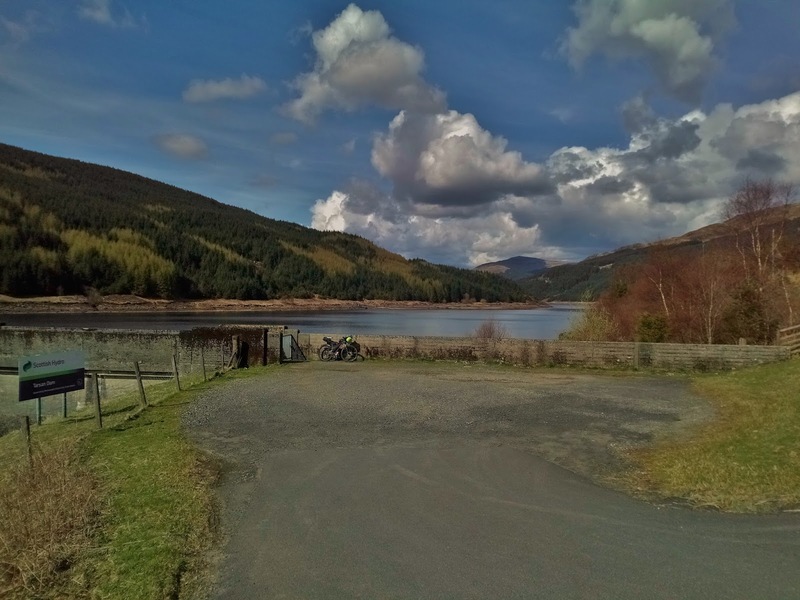 The ride along the side of the loch was very pleasant until I passed Glenlean farm and turned uphill once more onto a forest road which climbed and contoured round above the eastern shore of Loch Tarsan. 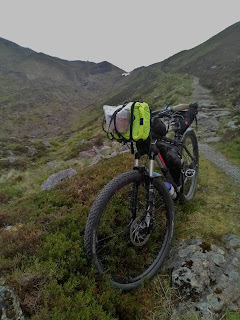 I decided to start looking for a spot to spend the night (it wasn't late but my legs were tired from all the climbing and I was past the halfway point of my circuit). One advantage of having plenty of time was that I could be choosy where I decided to stop. I passed a perfectly flat grassy layby with a water source which was surrounded by trees but decided to push on a little further in the hope of finding a campsite with a view. 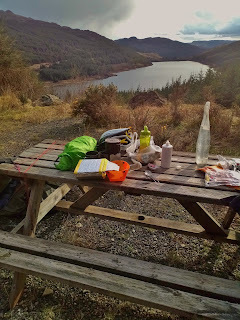 My luck was in as a little further on I found another layby with a stunning view and a picnic table! 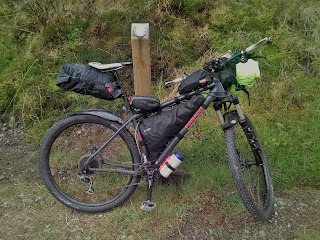 The ground was covered in gravel which gave me some concerns about puncturing my sleeping mat but I had a thin ground sheet to put underneath it to offer some protection. 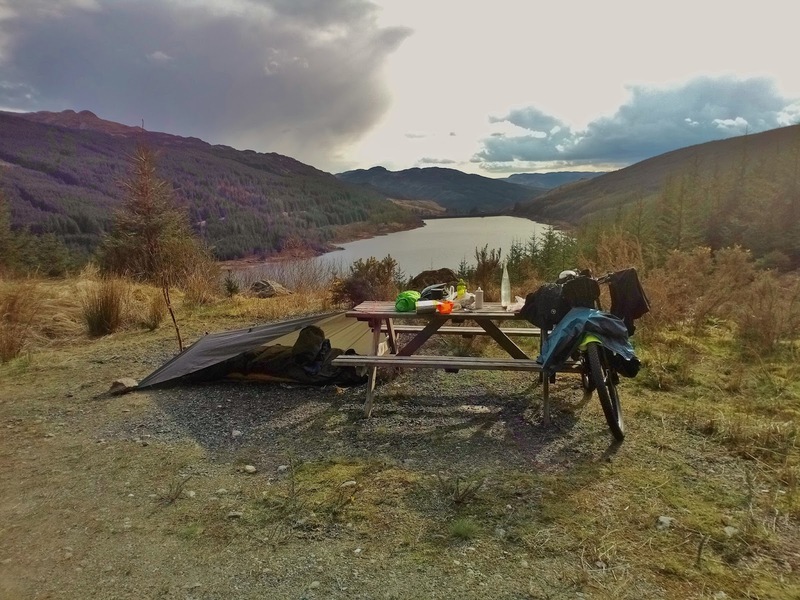 I decided to pitch my tarp supported by the picnic table to save using my bike and front wheel as "poles" like I usually do. 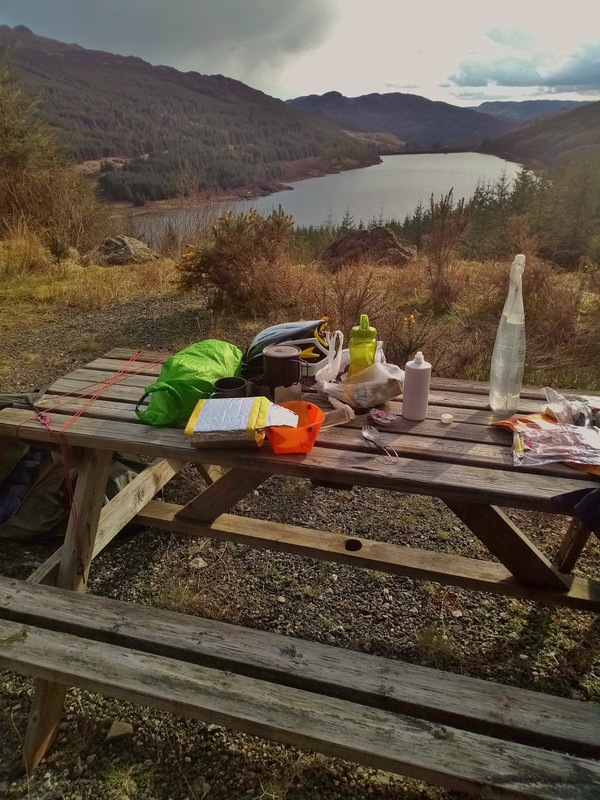 Once I was all set up it was just a matter of enjoying the sunshine while I cooked my dinner. 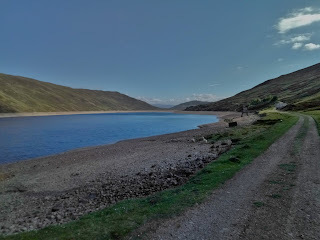 I was finished eating by 7pm so went for a short stroll along my route for the next morning before turning in very early. 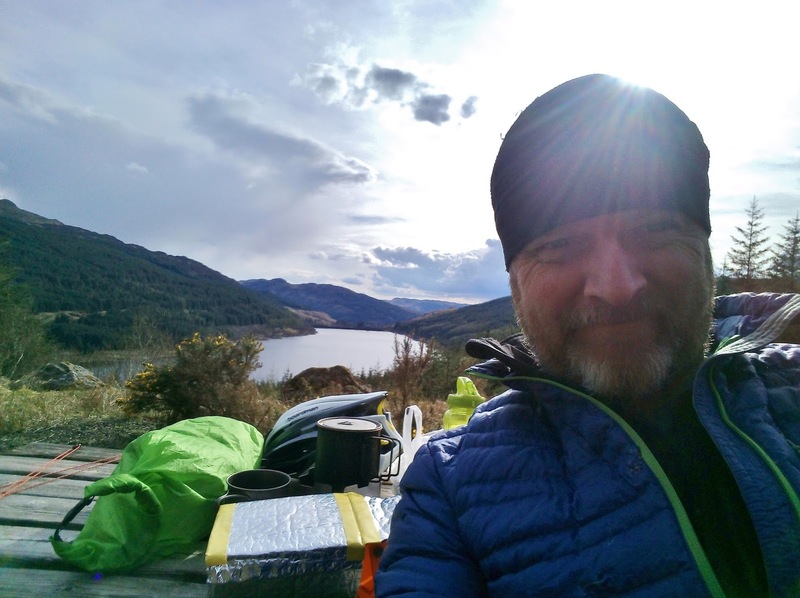 It was cold overnight with a full moon but I was toasty in my winter sleeping bag and bivi bag. As I'd gone to bed so early I woke early too, I got up and got started with breakfast but it was very cold and I had to wear all my cycling and camp clothing to keep warm until the sun came up. 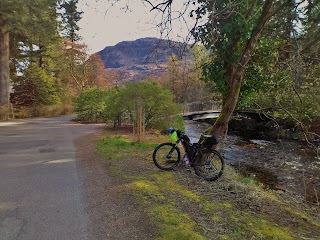 After breakfast I set off again (heading towards Glen Massan). 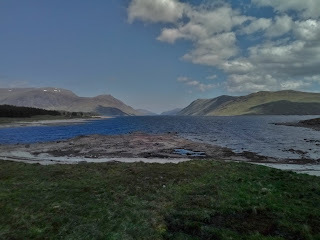 I was treated to a few final views of Loch Tarsan behind before I plunged down towards Glen Massan. I was amused to note that some other laybys had picnic tables as well. 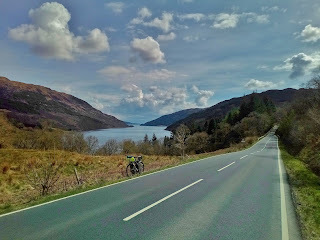 The descent into Glen Massan was really fast and fun and the scenery was lovely. 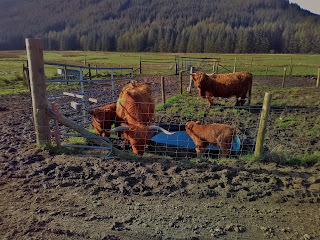 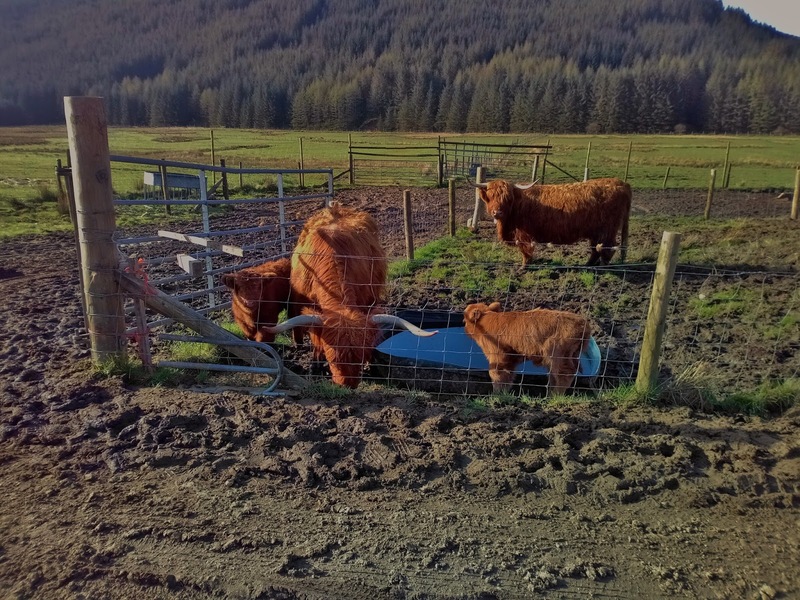 I passed two cows with tiny calves and had to stop and take a picture. The track down Glen Massan eventually turned into a tarmac road which wound it's way down the pretty glen. 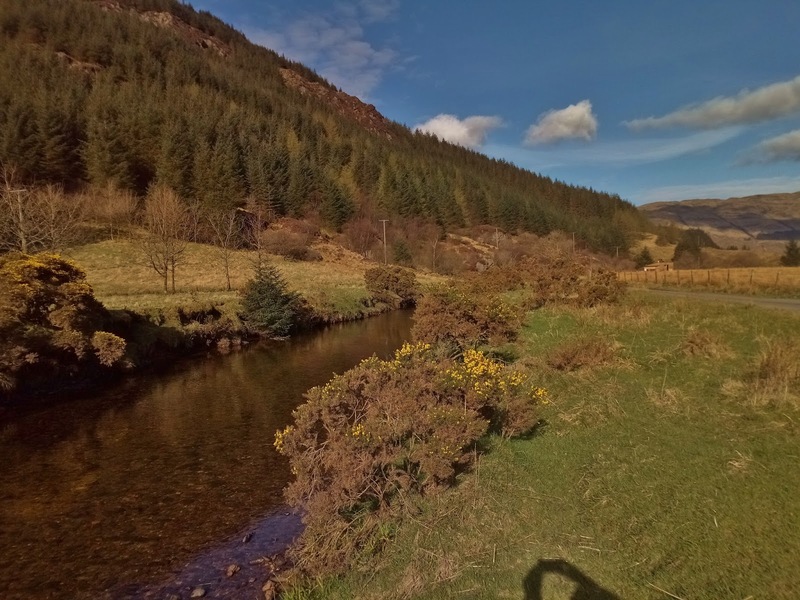 At the bottom of the glen I passed Benmore Botanic Gardens and Arboretum (which looked well worth a future visit) then there was a stretch alongside the River Eachaig. 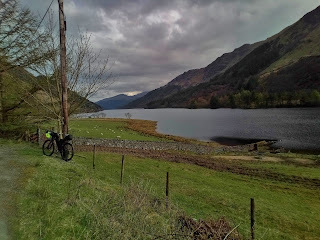 I followed the river up to it's source, Loch Eck and joined the rough track which follows it's western shore. 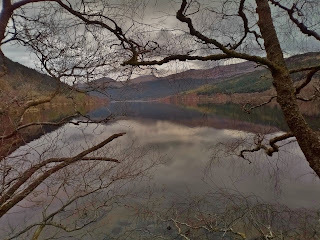 The track meandered and rose and fell along the length of Loch Eck and was very varied and picturesque. Eventually it emerged beyond the loch near my starting point at Glenbranter. It had been an enjoyable ride and confirmed my suspicions that I don't yet have the strength and endurance in my legs that I had last year, still it's a step in the right direction and hopefully the weather will continue to improve and allow me to do some of the more ambitious trips I have planned.